Run by students for students, your Students’ Union (SU) helps you make the most of your time at Warwick and ensures your views are heard. Having an SU means that societies and sports teams can operate, students can campaign for issues that affect them (tuition fees, accommodation conditions for example) and generally ensure that each student gets the most out of their time at university. Warwick Students’ Union is an independent, not-for-profit charitable organisation. The SU is the voice of our students on campus, in the local area and nationally. Seven democratically elected Sabbatical Officers head up the Student Council and lead the SU’s areas of operation: Welfare and Campaigns, Education, Democracy and Development, Societies, Sports and Postgraduate issues. In addition, there is a team of part-time officers: Liberation Officers, who represent the voice of minority groups on campus; Faculty Representatives, who represent your views on academic issues; the Part-Time and Mature Students Officer; Environment and Ethics Officer; and International Students’ Officers. You may choose to get involved in the direct running of your Union or simply want to have your say by voting in elections or attending All Student Meetings. The SU also operates our Student-Staff Liaison Committee (SSLC) system, which allows elected reps to discuss academic issues directly with departmental administrators. This has a direct impact on your education. If you’re passionate about making a difference on a wider scale, the SU runs and supports campaigning on issues such as the environment, human rights and animal welfare. In recent years, students have been involved with national and international campaigns including Love Community, International Women’s Week and Black History Month. Whatever you get involved with outside your studies at Warwick – sports, societies or just socialising – the SU will undoubtedly shape your experience. The SU oversees our student-run societies and sports clubs, and provides a packed programme of events and entertainment. 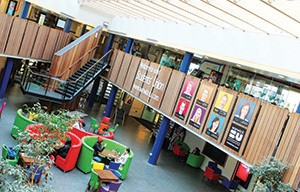 The SU building is the hub of many of Warwick’s cafés, bars and shops. All profits from the SU’s food and drink outlets, and from its entertainment venues and events, are reinvested in improving your student experience. 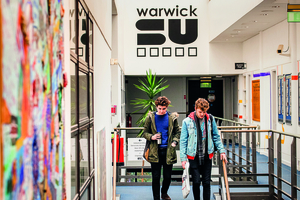 The SU also plays an important role in supporting you during your time at Warwick. As well as running its own advice centre, it has strong links with central University support services and can signpost you towards sources of advice on different issues. The SU raises millions every year and is the home of Pop, The Dirty Duck and other places you’ll drink. But more importantly the SU spends a lot of money on our behalf for societies etc while lobbying for things that you want. A recent example that the SU has adopted is for more work spaces during exam periods. Read more.